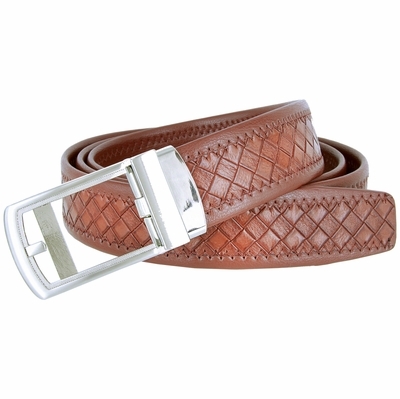 LA-2055 Diamond Pattern Leather Dress Belt. Diamond Textured with Zig-Zag Stitched Edges. 1-3/8" = 35mm wide Leather Belt. Removable Clamp Automatic Ratchet Style Belt Buckle. Just slide the belt strap and it locks in place. A decent casual high grade easy to use and durable ratchet belt that can be use for all occasion. "ONE SIZE FIT ALL" BELT WILL FIT UP TO SIZE 46" Then it Can be resized by removing the buckle and cutting the belt strap to the desired size. PLEASE BE AWARE THAT BY DOING THIS WILL VOID THE WARRANTY, NO REFUND OR EXCHANGE WILL BE ALLOWED, so please inspect the belt make sure that you like the belt before you cutting it to size. Belt is measured from where the leather ends at the buckle end to the middle hole at the tip end.